A new Kannada daily newspaper ‘Cauvery Times’ has been launched in Kodagu by B.C. 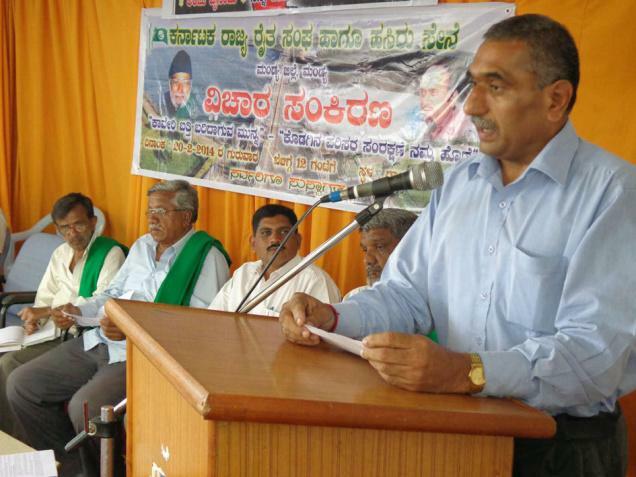 Nanjappa (in picture addressing farmers), a well-known environmentalist. Nanjappa answers a slew of questions from Sundar on the need for a new paper to protect the long-term interests of Kodagu. Sundar: What made you want to start Cauvery Times? Does Kodagu really need another Kannada newspaper? Nanjappa: As you may know, I am the President of the Basavanna Devara Bana Samithi, this is an organization dedicated to saving the sacred groves or the ancient forests connected to the temples in Kodagu. What I noticed many years ago as an activist, was that, just because you have a good cause, does not mean that you will get good press coverage. There are many forces that influence the news carried by a newspaper. Most of the daily newspapers in Kodagu are very selective about the news stories that they cover. In fact, the kind of news carried by a newspaper, and how such news is presented to the public, depends upon which lobby the newspaper is aligned with. To explain that further, some of the newspapers are supported by the timber lobby, some other newspapers have the backing of the land mafia, the sand mining mafia, or the vote bank mafia. Naturally, the news the public gets to read is not the whole truth, but information that has been tailored to the needs of the lobby that backs the newspaper. This is a very dangerous trend for Kodagu, as it protects and promotes people with very selfish vested interests, people who simply do not care for the people or the landscape of Kodagu. If left unchallenged, such a media can completely destroy the ecology and the indigenous people of Kodagu. I see the need for a newspaper that is independent in its views, a newspaper that is not backed by any lobby and can therefore be impartial in their reporting. This kind of newspaper can protect the local ecology and the interests of the local indigenous communities. Sundar: How would you describe the quality of journalism in Kodagu today? Nanjappa: Most of the publications in Kodagu are run as businesses with an eye on profits and protecting lobby interests. There is no focus on protecting the long-term interests of the land and the people. When elections are close by, the news delivered to the consuming public is tailored with an eye on the election. Which means politicians are at work behind the scenes at these newspapers, trying to do damage control where their parties are concerned. The real issues of concern to the district’s future are underplayed, and non-issues are given great importance for sensationalism, and to distract the people from the real issues. What are the real issues? Rampant corruption (this issue is covered, but not accurately and completely), inadequate and insensitive leadership, tribal communities in neglect, a rapidly degrading ecology, the impact of climate change in an agrarian economy, a society in turmoil because it is unable to absorb the effects of corruption and uncontrolled migration. Sundar: What is the difference that Cauvery Times can make to Kodagu? Nanjappa: Our aim is to empower the people of Kodagu with information that has not been compromised by any lobby. Such neutral information will enable them to take the right action to protect their interests. The people have to make a journey from the current confusion, to having a clarity of vision, and only an unbiased newspaper can do that. In the long run, we would like to change the newspaper culture in Kodagu from one having such extreme focus on politicians, crime, scandals and gossip….to one which values ordinary people, creates positive leadership, supports the creation of ideas and solutions, encourages future-oriented thinking, and finds ways to protect our precious environment and cultural heritage. Sundar: Can you tell us about the people behind Cauvery Times? Nanjappa: We are a group of people who are based in Kodagu and are deeply familiar with local issues and needs. We are passionate about preserving and promoting the local ecology, people and culture. Most of us have marketing backgrounds, a few of us are agriculturists. I personally operate an agri-consultancy and have built a rapport with people from diverse backgrounds all over Kodagu….from Kutta to Kodlipet and Karike to Kushalnagar. Our editorial staff are a young and enthusiastic bunch of people, and they are supervised by experienced individuals from a journalistic background. Sundar: How has the reaction been so far to this newly launched newspaper? Nanjappa: We have got a very heartening response, our readers find our approach fresh and our circulation is growing by the day. Our page 2 content is becoming increasingly popular, thanks to its human interest stories, personality development tips and short stories. The overall layout design, and readable font too has met with much appreciation. We are looking forward to more growth and to having a social and political impact in Kodagu which will change the district for the better, in the years to come. Searching questions to cull out the objectives of Cauvery Times. Editor has spoken his heart out. His firms words be put in action in all the issues Cauvery Times carries. I Wish him all the best.